You'll be £19.99 closer to your next £10.00 credit when you purchase February 1942. What's this? As the saying goes 'it is darkest before the dawn' and so it was for Churchill and the British people during the Second World War. During February 1942, bad news of disasters came in an unbroken and seemingly endless sequence from the Far East to the Home Front. Some such as the Fall of Singapore and the Royal Navy's humiliation over the escape of the Scharhnhorst and Gneisenau are well known but always worth re-telling. 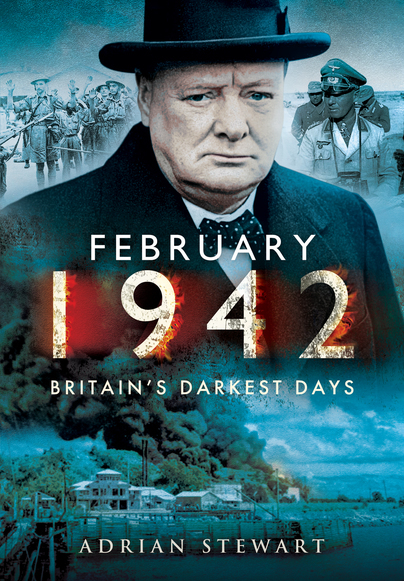 Others less written about such as the challenge to Churchill at home, heavily strained relations with Commonwealth allies, the Japanese raid on Darwin and Rommel's return in North Africa were equally serious and full of foreboding for the future outcome of the War. February 1942 was in retrospect, the month in which many long-established beliefs were destroyed for ever. It was the month that confirmed that Britain no longer ruled the waves; that saw British prestige so damaged that it could never be fully restored; that foreshadowed and ensured the end of Britain's Empire; that demonstrated the immense strain that could be put on Britain's relations with the Commonwealth's self-governing Dominions. In short it was the month that changed Britain's world. It was also the month at the end of which Britain seemed likely to lose the War. Happily, this did not prove the case – so perhaps February 1942 further shows that a country can receive terrible blows but still survive and endure. A useful book to keep on the shelf even if only to use as a reference to other sources.